DMDII is sharing not only its advanced manufacturing equipment but also its technical expertise to support innovation. DMDII’s R&D testbed eliminates a manufacturer’s need to buy testing equipment and give up production capacity for experimentation. For example, when engineers discover a potential operational improvement, such as a new turning technique or tool design, they must test it in a real-world environment and collect the data. Since manufacturing equipment and production downtime is expensive, R&D engineers often wait months for internal equipment to become available. Now academic and commercial institutions can utilize DMDII’s equipment at its Goose Island facility in Chicago for as long as several months, with the option of receiving additional support from DMDII’s technical team, led by 28-year manufacturing veteran Tony Del Sesto. This testbed is open to DMDII members and non-members, and the cost varies based on usage and need. Del Sesto’s team includes mechanical engineering, electrical engineering, systems integration engineering, manufacturing engineering, machinist, and assembly specialists. months had it been done internally. The innovations are already being implemented in their operations. “We’re alleviating a bottleneck in the manufacturing R&D process. Helping companies validate a new technology in six days when it could otherwise take six months speaks to what digital manufacturing and DMDII is all about,” said UI LABS Chief Program Officer Thomas McDermott. What are you going to learn in 2018? 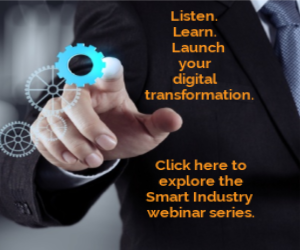 Check out our new lineup of Smart Industry webinars here.